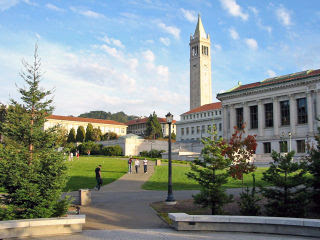 The University of California, Berkeley is a major research university located in Berkeley, California, United States. 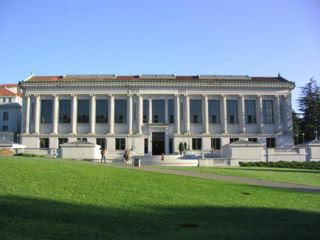 Informally referred to by such abbreviations as Cal, California, UC Berkeley, and simply Berkeley, it is the oldest and flagship campus of the ten-campus University of California. Berkeley offers some 300 undergraduate and graduate degree programs in a wide range of disciplines. The university occupies 6,651 acres (27 km²) with the central campus resting on approximately 200 acres (0.8 km²). The University was founded in 1868 in a merger of the private College of California and the public Agricultural, Mining, and Mechanical Arts College. By the 1930s, Berkeley had established itself as a premier research university, and today counts sixty-one Nobel Laureates among its faculty, researchers and alumni. Berkeley physicists led and hand-picked the team of scientists who worked on the Manhattan Project, which developed the atomic bomb during World War II and the hydrogen bomb soon afterwards. The University has managed Lawrence Berkeley National Laboratory and the nation's two principal nuclear weapons labs (now also used for more peaceful research) at Livermore, California, and Los Alamos, New Mexico, ever since. Berkeley student-athletes compete intercollegiately as the California Golden Bears. A member of both the Pacific-10 Conference and the Mountain Pacific Sports Federation in the NCAA, Cal students have won national titles in many sports, including football, men's basketball, baseball, softball, water polo, rugby and crew. In addition, they have won over 100 Olympic medals. The official colors of the university and its athletic teams are Yale blue and California gold. The university that was born nearly 20 years later was the product of a merger between the College of California (a private institution) and the Agricultural, Mining, and Mechanical Arts College (a land grant institution). The College of California, founded by former Congregational minister Henry Durant from New England, was incorporated in 1855 in Oakland. Its curriculum was modeled after that of Yale and Harvard, with the addition of modern languages to the core courses in Latin, Greek, history, English, mathematics, and natural history. With an eye to future expansion, the board of trustees augmented the college's Oakland holdings with the purchase of 160 acres of land four miles north, on a site they named Berkeley in 1866. (Cal's Charter was introduced in 1868.) This original tract was to be considerably expanded over the years. While the College of California was in its infancy, efforts continued in the state legislature to create a public educational institution, and in 1866 the legislature took advantage of the federal Morrill Land Grant Act of 1862 to establish the Agricultural, Mining, and Mechanical Arts College. The college was to teach agricultural, mechanical arts, and military tactics "to promote the liberal and practical education of the industrial classes in the several pursuits and professions in life." Scientific and classical studies were not to be excluded but were of secondary importance. The boards of trustees of the College of California and the Agricultural, Mining, and Mechanical Arts College decided to merge the two schools to their mutual advantage -- one had land but insufficient funds and the other had ample public funds but no land-on the condition that the curricula of both schools be blended to form "a complete university." On March 23, 1868, the governor signed into law the Organic Act that created the University of California. 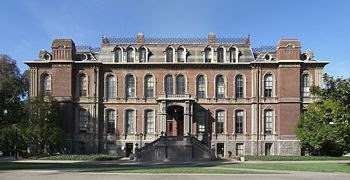 The new university used the former College of California's buildings in Oakland until South Hall and North Hall were completed on the Berkeley site (South Hall is still standing), and in September 1873 the University, with an enrollment of 191 students, moved to Berkeley. In the 1930s research on campus burgeoned in nuclear physics, chemistry, and biology, leading to the development of the first cyclotron by Ernest O. Lawrence, the isolation of the human polio virus, and the discovery of a string of elements heavier than uranium. Twenty members of the Berkeley faculty have been awarded Nobel Prizes for these and subsequent discoveries, as well as in literature and economics, for liberal arts kept pace with physical sciences. In 1966 Berkeley was recognized by the American Council on Education as "the best balanced distinguished university in the country." Berkeley's 130-plus academic departments and programs are organized into 14 unique colleges and schools. "Colleges" are both undergraduate and graduate, while "Schools" are generally graduate only, though some offer undergraduate majors, minors, or courses. Berkeley is a comprehensive university, offering over 7,000 courses in nearly 300 degree programs. The university awards over 5,500 bachelor's degrees, 2,000 master's degrees, 900 doctorates, and 200 law degrees each year. The student-faculty ratio is 15.5 to 1, and the average class consists of 30 students (not including discussion sections led by graduate student instructors). Class size ranges from introductory courses with hundreds of students and seminars with fewer than ten. Berkeley's enrollment of National Merit Scholars was third in the nation until 2002, when participation in the National Merit program was discontinued. Berkeley awards the following degrees: B.A., B.S., M.A., M.S., M.F.A., M.B.A., M.F.E., M.C.P., M.Arch., M.Eng., M.F., M.I.M.S., M.J., M.L.A., M.P.H., M.P.P., M.S.W., M.U.D., LL.M., Ph.D., D.Eng., Ed.D., D.O., Dr.P.H., J.D., J.S.D. According to the National Research Council, Berkeley ranks first nationally in the number of graduate programs in the top ten in their fields (97%, 35 of 36 programs) and first nationally in the number of "distinguished" programs for the scholarship of the faculty (32 programs). Berkeley is the only university in the nation to achieve top 5 rankings for all of its PhD programs in those disciplines covered by the US News and World Report graduate school survey. In a survey of "Top American Research Universities" released by The Center for Measuring University Performance at Arizona State University, Berkeley ranked seventh overall and first among public institutions. In addition to its distinguished post-graduate programs, US News also consistently ranks Berkeley as the nation’s top undergraduate public university and within the top three overall for both Undergraduate Business and Undergraduate Engineering. U.S. News & World Report recently ranked Berkeley's undergraduate program twenty-first nationally in terms of "academic excellence." 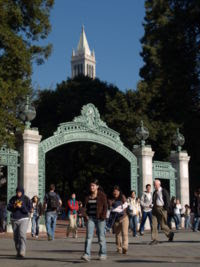 In its 2007 annual college rankings, The Washington Monthly ranks Berkeley third nationally with criteria based on research, community service, and social mobility. 31% of admitted students receive federal Pell grants.